According to the common law of Moldavia and Wallachia, the murder of a person entailed not only the execution of the murderer, but also the imposition upon him, or if he were unknown upon the village nearest to the spot where the murder had been committed, of a heavy fine ("prezul sangelui" = blood-money), which fell to the relations of the victim. Villages that could not pay the fine were depopulated. This legislation applied to Jews in common with the other inhabitants, and the communities were made collectively responsible for the fines. As commercial travelers and pedlers, the Jews journeyed constantly, and while the Rumanians were hospitable to every traveler, they considered it hardly a mortal crime to murder a Turk, a Tatar, or a Jew (Cantemir, "Descriptio Moldaviæ," Rumanian ed., p. 260, Jassy, 1851). The fine imposed for the murder of a Jew was very heavy; a decree of Prince Petrashcu of Wallachia, in 1553, mentions that Mircea the Great (1382-1409) amerced the village of Vianul, beyond the Olt, in the sum of 40,000 aspers, upon the complaint of the wife and the mother of a Jew who had been murdered in that vicinity. The villagers, being unable to raise such a sum, implored the clemency of the prince, who paid the amount out of his own treasury. In order to evade payment of blood-money, villagers, on finding a corpse, would often throw it into a river or pond, or perhaps inter it, to avoid notice by the authorities. This practise caused great hardship to Jewish wives who, in addition to the loss of their husbands, saw themselves doomed to perpetual widowhood by the Jewish law concerning disappearances (see 'Agunah). 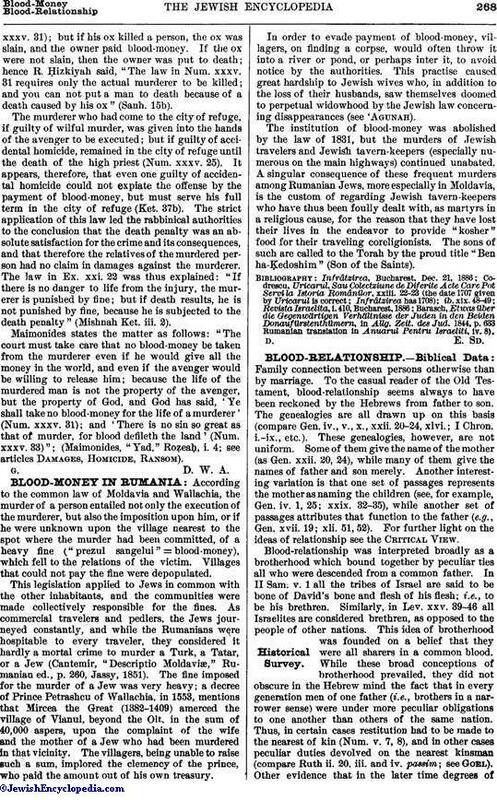 The institution of blood-money was abolished by the law of 1831, but the murders of Jewish travelers and Jewish tavern-keepers (especially numerous on the main highways) continued unabated. A singular consequence of these frequent murders among Rumanian Jews, more especially in Moldavia, is the custom of regarding Jewish tavern-keepers who have thus been foully dealt with, as martyrs in a religious cause, for the reason that they have lost their lives in the endeavor to provide "kosher" food for their traveling coreligionists. The sons of such are called to the Torah by the proud title "Ben ha-Ḳedoshim" (Son of the Saints). Barasch, Etwas über die Gegenwärtigen Verhältnisse der Juden in den Beiden Donaufürstenthümern, in Allg. Zeit. des Jud. 1844, p. 633 Rumanian translation in Anuarul Pentru Israeliti, iv. 8).